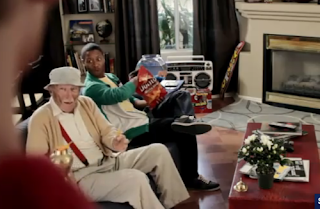 Capturing the #4 spot in the USA Today Super Bowl poll is Doritos "Grandpa Rises from the Ashes" spot. The commercial opens with a man giving last minute details to his buddy as he backs out the door, "Hey dude, feed the fish, water the plant. I'll see you next Thursday." Of course, his housesitter is immersed in a TV show while munching away at his Doritos, barely registering the instructions he just received. But at some point, his buddy's words float into his brain and a look of anguish descends upon him. Oh-oh. He runs to the fish bowl only to see the dead fish laying on the bottom of the bowl. He crunches up Doritos and desperately feeds them to the fish. What? Is this possible? The fish has come back to life! This is followed in rapid succession by feeding the dead plant Doritos and then rapidly cleaning up the remnants of Doritos that are scattered around the apartment. Just when he is looking smug and happy with himself, his elbow hits an urn on the mantle. It comes crashing down and deposits ashes - well, grandpa's ashes to be exact - all over the floor. Oh-oh. Flash forward. His buddy comes home, opens the door, and with a shocked look on his face, utters, "Grandpa?" The spot ends with him hugging his grandpa, to a tearful commentary of, "Grandpa, I missed you." Like all the Doritos spots, this one has its witty and charming moments. But, the enormity of the message is somewhat lost on me. Eating a handful of Doritos brings you back from the dead? I know, I know, I shouldn't be so literal. Okay, Doritos adds a little life to your life. I guess I buy that.